Bio Glucan stimulates the innate immune system - the body's first line of defence against infection. With increasing resistance to antibiotics, and the emergence of vaccine-resistant organisms (think avian flu), the need to activate and support the need immune system has become increasingly recognised. Bio Glucan contains beta 1,3/1,6 glucans, naturally occurring complex sugars obtained from yeasts and fungi. 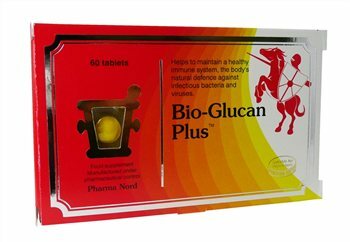 Supplementation with Bio Glucan helps to maintain a healthy immune system. Anti-caking agent: Tricalcium phosphate, Selenium (SelenoPrecise yeast*), Stabiliser: Polyvinylpyrrolidon, Anti-caking agent: Magnesium stearate, Glazing agent: Hydroxypropyl methyl cellulose, Talc, Vitamin D3 (Cholecalciferol), Colour: Titanium dioxide, Riboflavin.